If there is “nothing new under the sun,” perhaps the main task now facing the Western church is not to reinvent or be relevant, but to remember. The truth of the gospel is still contained within vintage faith statements. Within creeds and catechisms we can have our faith strengthened, our knowledge broadened, and our love for Jesus deepened. 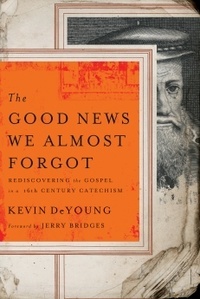 In The Good News We Almost Forgot, Kevin DeYoung explores the Heidelberg Catechism and writes 52 brief chapters on what it has shown him. The Heidelberg is largely a commentary on the Apostle’s Creed, the Ten Commandments, and the Lord’s Prayer, and deals with man’s guilt, God’s grace, and believers’ gratitude. This book is a clear-headed, warm-hearted exploration of the faith, simple enough for young believers and deep enough for mature believers. DeYoung writes, “The gospel summarized in the Heidelberg Catechism is glorious, its Christ gracious, its comfort rich, its Spirit strong, its God Sovereign, and its truth timeless.” Come and see how your soul can be warmed by the elegantly and logically stated doctrine that matters most: We are great sinners and Christ is a greater Savior!